Had my first night of black-lighting with the mercury vapor light – pretty decent turn out. I got six species of Acronictines, but they were all males. I’m really hoping for some females in order to get eggs! My friend and I also encountered some other interesting creatures. That is bound to happen when you set up a light and sheet at night. 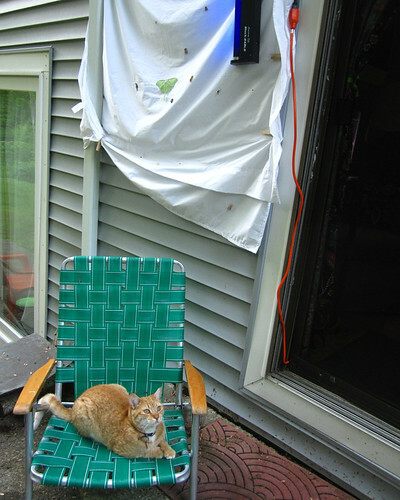 Here is the set up: The base is a projector screen (looks to be about 1970s, cost $5 at a garage sale), covered by a sheet. 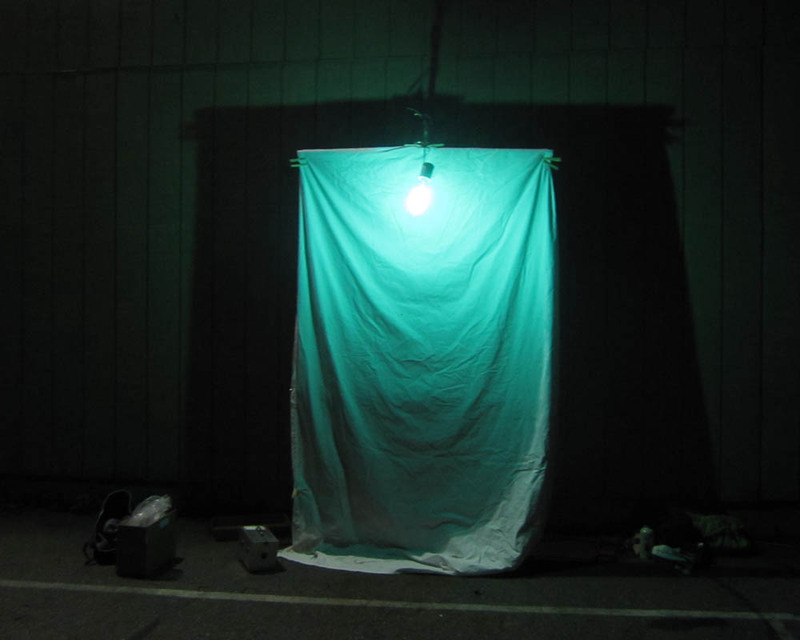 We hung the mercury vapor light from a branch to hold it away from the sheet (my advisor has many sheets with holes burned into them). 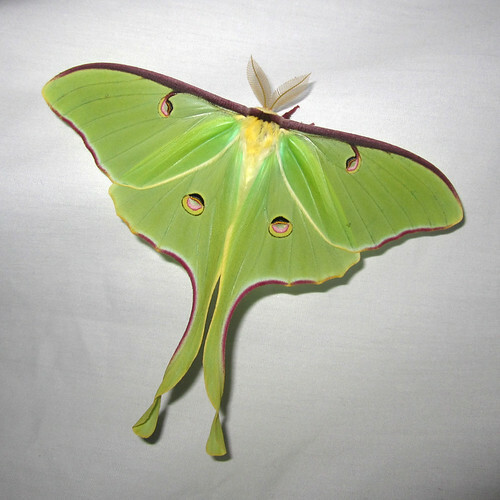 Some of the earliest visitors were the luna moths (Actias luna). These were both males – I could tell based on the antennae, and small size of their abdomens. 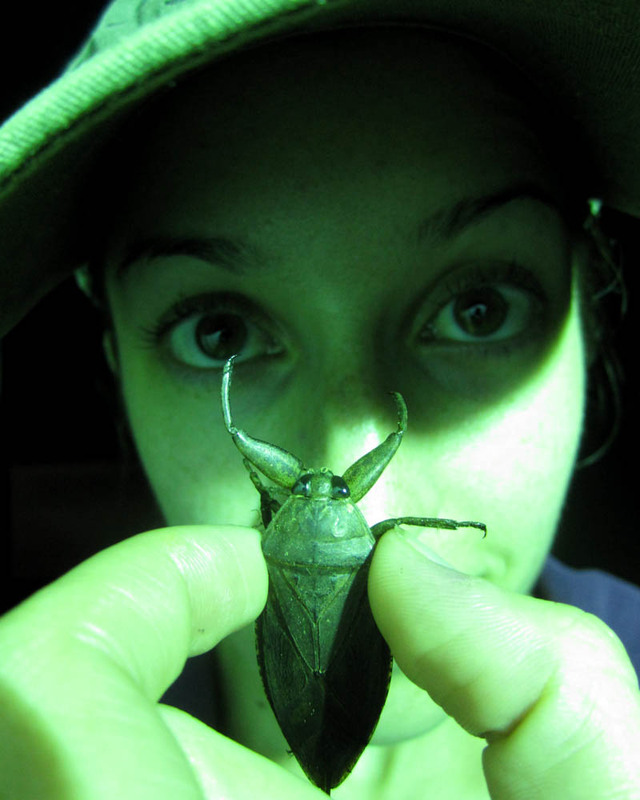 This giant water bug (Lethocerus americanus) sounded like a small helicopter coming toward the sheet – and then it hit me on the back of the head! It was a feisty one. 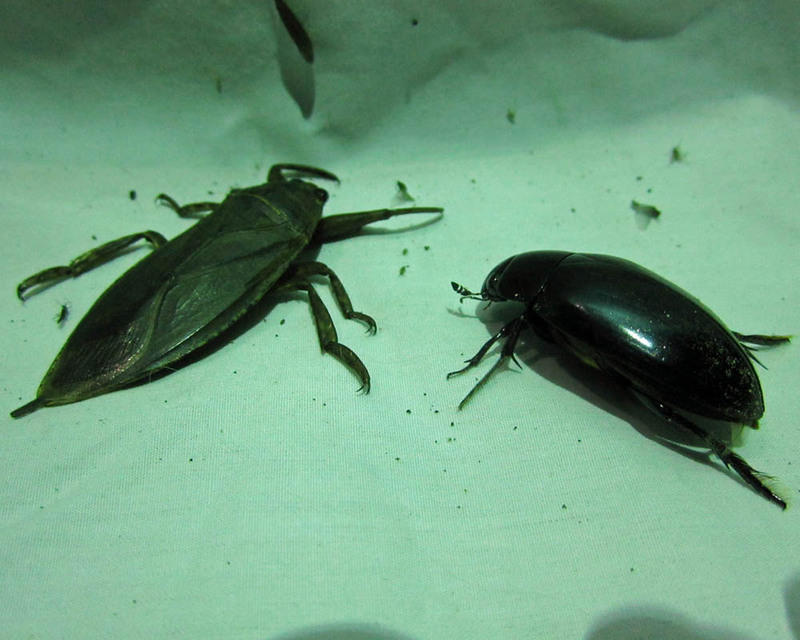 The water bug made a friend at the sheet – an equally as large hydrophilid, a water beetle. 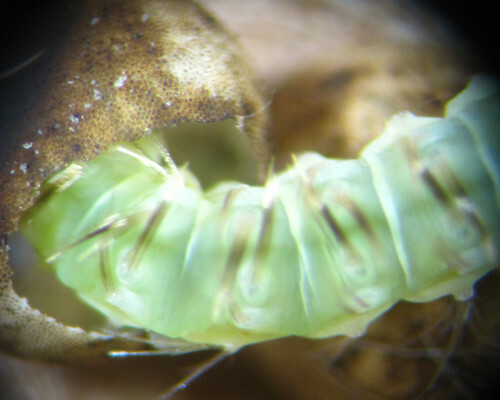 Luckily hydrophilids are scavengers, so they do not have the same terrifying beak as the water bug. They are so smooth you can hardly pick them up. 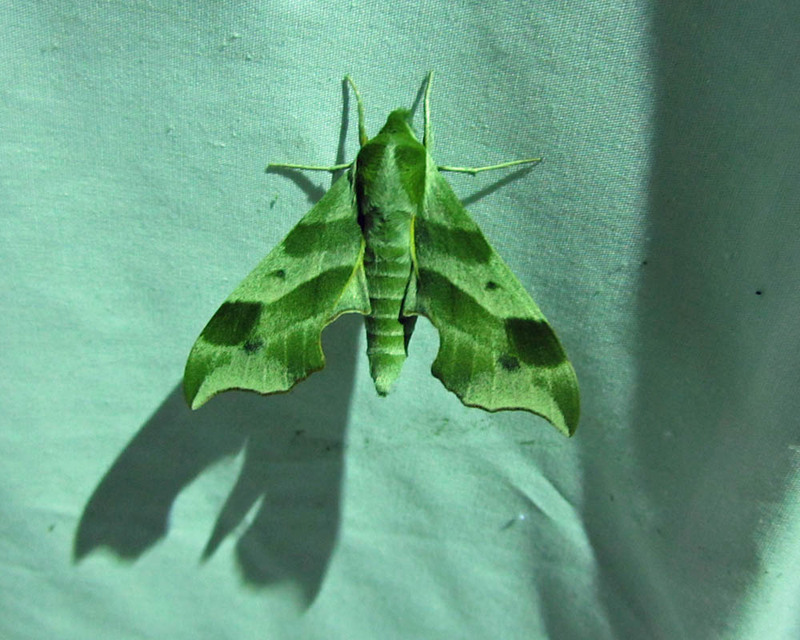 A very pretty moth – the hog sphinx, (Darapsa myron). I am excited for future black-lighting endeavors this summer. 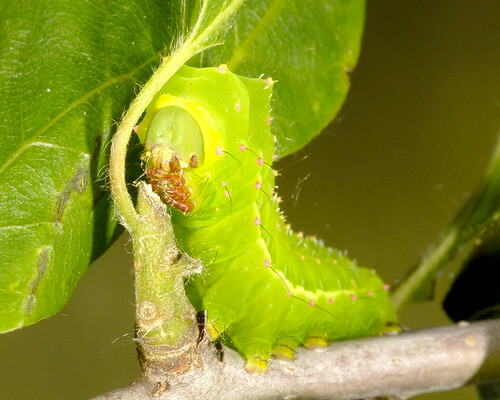 I’m down to one luna moth caterpillar… he is getting to be quite a glutton. You can see what he looked like as a young’n here and here and here. The luna caterpillars are getting a little out of control… I have decided I am only going to keep 20 for now, maybe whittle that down to 10 as they get bigger. The rest, I am unsure of their fate, they will probably get mailed back to their collection locality, now that they’ve had a head start. So this is my little crew of eating machines. 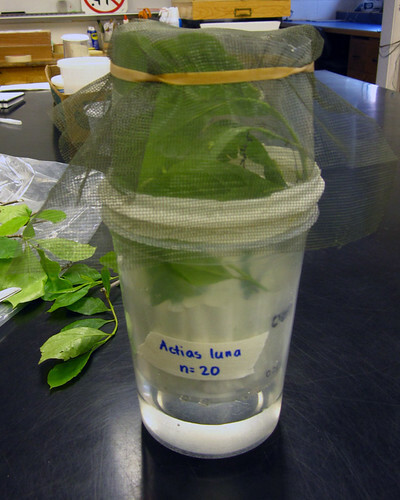 They needed a new container, something I can keep a branch of leaves fresh in, and also provide much more ventilation. So with some advice from my advisor, I came up with this contraption. I taped two containers together, cutting the top off of one and putting netting on top. I cut a hole in the bottom to put a stick through, and settled the containers inside a larger one, putting water in the bottom. 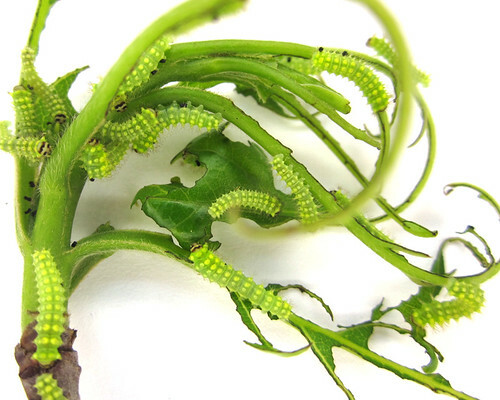 The plant and a coffee filter (to catch frass) are now home to 20 adorable caterpillars gaining more colorful spines. 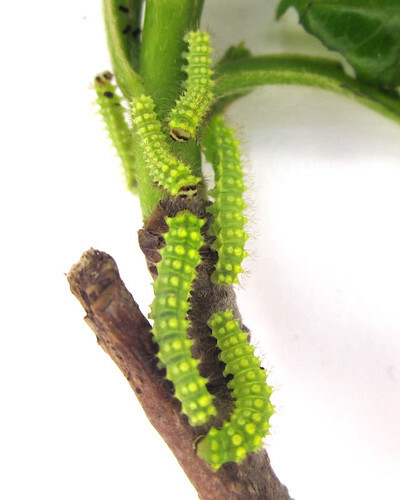 I went to check on my Actias luna caterpillars… and found them to be a little hungry. They sure know how to eat! 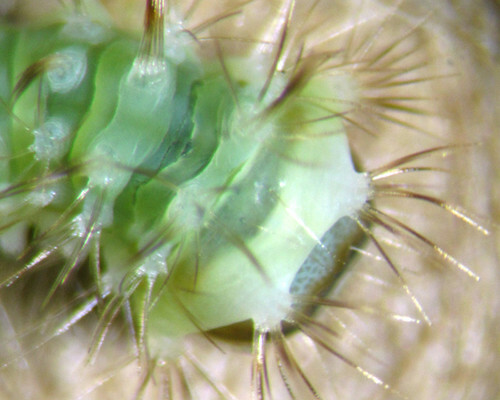 And look at those adorable little faces… I have not been keeping track of instars on these, as they are not part of my research. I’m keeping them just for fun, and to hopefully give them a head-start if they’re released – the adult was collected in another state, so I don’t want to release them here, so we might mail some back! I’m not sure if I can keep up with their demand for food as they get bigger, though. The last round of stragglers hatched, and I’m up to 105! If anyone at/near UConn wants some caterpillars to raise, please let me know and stop by. They would be great as a summer camp or classroom demonstration, as long as you have some black gum or hickory plants nearby. You’ll have to kill the adults, though, as we don’t want to mess with the population by bringing in genetic material from another part of the country. The kids won’t have to know! 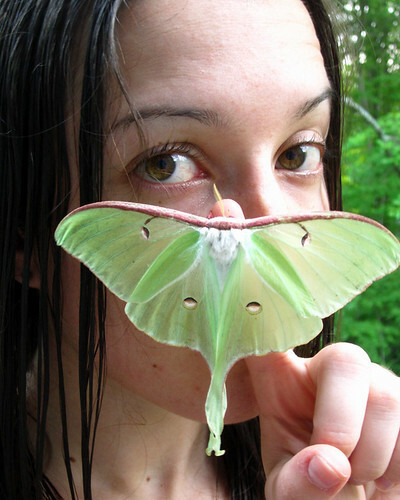 One day we had a guest in the lab – a tattered female Actias luna (luna moth) who had been collected by my advisor. She was kept in a big paper bag, in which she laid a few dozen eggs. 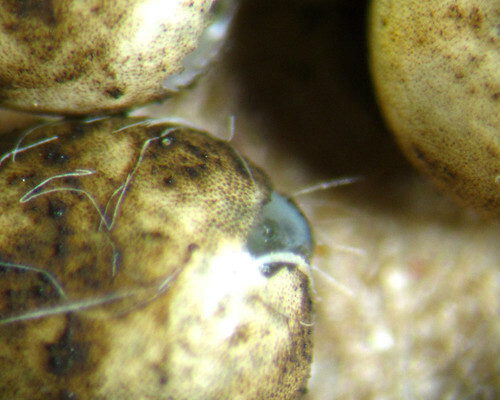 And the eggs have hatched! The funniest part was I could HEAR them chewing out of the eggs. Their little jaws were working fast! They all hatched over the course of four days… a few stragglers hatched last night. Wiggling and wiggling… it was fun watching their folded up hairs springing out, their plump bodies expanding, legs waving in the air. And then… bam! 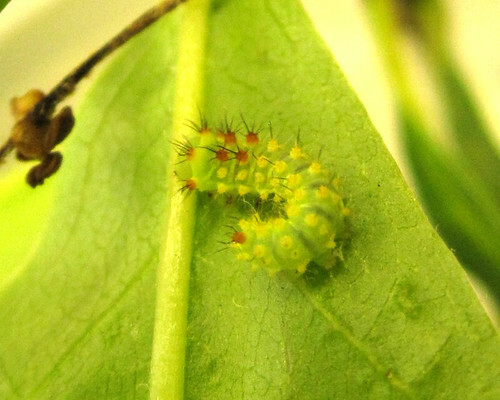 Cute caterpillar! This closeup is deceiving, they were about 6mm long. Now I bet you’re thinking – oh man, I wish I could have seen that! You can imagine how giddy I was to get this footage. My camera actually ran out of battery power as I was filming the first attempt, but a fellow lab member let me borrow his camera. I have a blacklight and a sheet set up outside my apartment to (hopefully!!!) get my hands on some female Acronicta. My neighbor’s cat, Sid, has been helping me. And here I am, on my third night of staying up too late (I usually get to bed around 10:30), with no luck so far. It’s not like there has been a lack of insect visitors, though. I have an extension cord running outside, so my screen door cannot close all the way… meaning I am collecting an interesting assortment of invertebrate life in my apartment. Mostly tiny flies and moths freaking out around my ceiling lights. Luckily the mosquitoes have refrained from joining the party. There are some neat things outside, too. Very pretty arctiids, geometrids, pyralids, notodontids… and of course an assortment of beetles, flies, caddisflies, mayflies, and spiders. 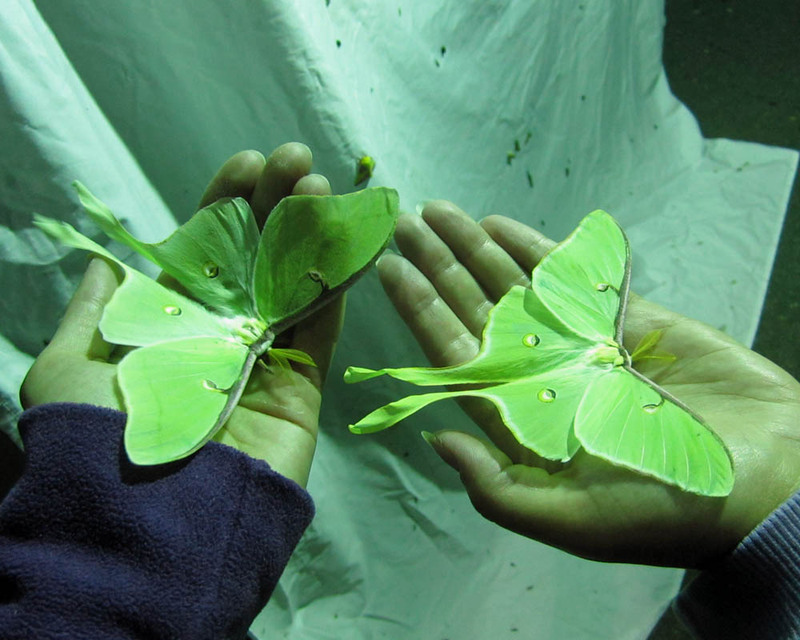 And then… the luna moths. That’s right, in two nights, I’ve attracted two lunas! The first one, I didn’t get a picture of until the next morning. I was so tempted to keep him… but I figured such a studly moth deserves to go out and find a mate. And then this morning I discovered this pretty lady on the stone wall just a few feet away from my sheet. I hope she goes off to lay a lot of eggs! I have enough of my own, as you’ll see soon… (excuse my hair, I had just washed it) I wonder if I’ll get another tonight?